Version of A245 but with green enamel edge. All are in the Ely shape. The gilding on Warwick was hand applied, not printed, a testament to the skill of the gilders. It took two years of training, during which no saleable ware was produced, to achieve this standard of work (see Betty Wherry - gold in my veins). The Garnett spray on the variant version (here in the Ely shape) may have been applied to cover a blemish in the glaze to make a saleable piece. 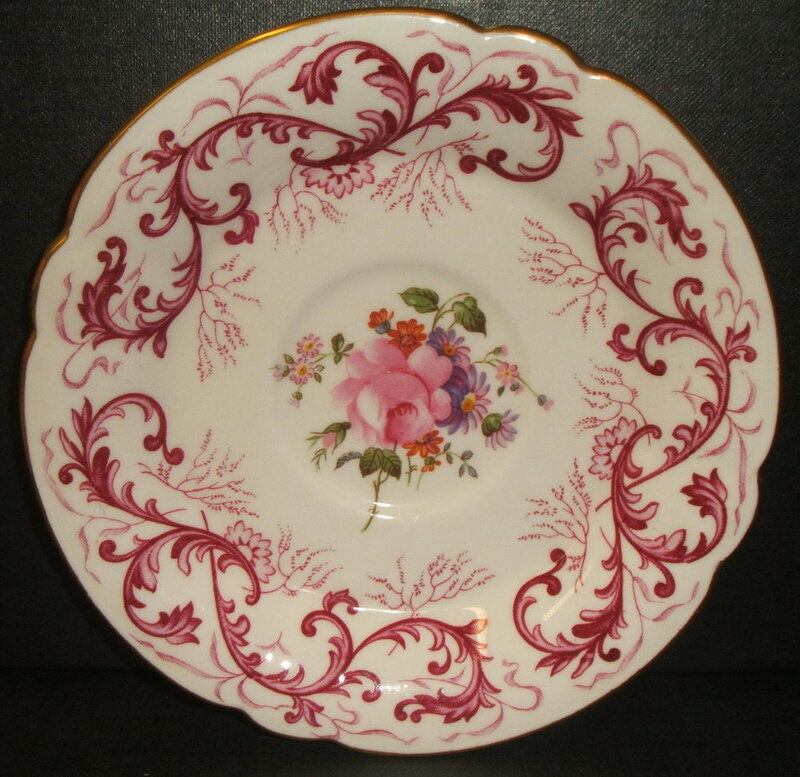 Such plates were often selected to be used as Service plates for this reason. I have seen the border on the A256 plate used to decorate plates with a Dean centre manufactured in a much later period. A259 is in the Ely shape. The coffee can and stand marked A264 is here shown in the Edinburgh shape but is also listed as Ely as is pattern A265. I believe A267 to be in the Plain shape. The fish scenes are by Donald Birbeck, taken from paintings by him which were then made into prints and then enamelled by hand. The series includes Pike (Immature - shown above), Lake Bream (shown below), Perch, Rainbow Trout, Samlets, Grayling, Black Basse, Roach, Salmon, Chub, Brown Trout and Lake Bass - 12 in all. 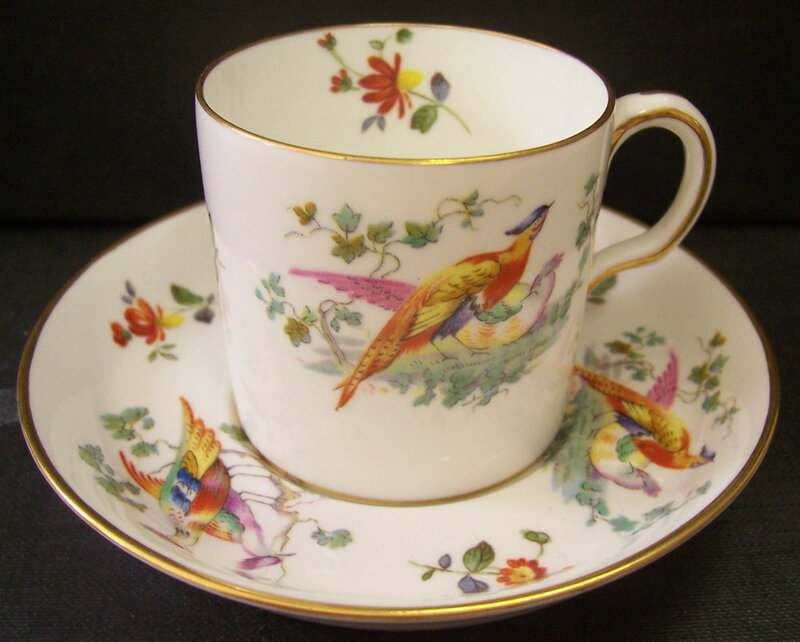 A268 is a similar set of game bird centre plates by Donald Birbeck. Mallard here appears to be in the Plain shape, Summer Ducks in the Ely shape. They are characterised by a thick gold band around the edge. In addition to the two examples above the following titles have been recorded:- Blue Winged Teal, Pintail Ducks, Prairie Hens, Ruffed Grouse, Snipe, Wild Turkey, Bob White, Red Grouse, Ptamigan and Canvas Back Ducks. 12 in total. A274 is in the Ely shape. All pieces in this pattern appear in the Silver shape. Some of the flower sprays are printed, with the roses applied by hand. Others, such as the Chivers example above are entirely hand painted and signed by the artist. The Chivers plates are dated 1939. I have included an enlarged image of the Gresley plate to show in detail the hand painted centre. A278 is a Brighton shape plate with a Gresley hand painted centre. listed as having an ivory ground, in this example the ground is Montreal green. This is followed by a version with a celadon ground. The flower centre is unsigned. I include two seascape centre plates by Dean in pattern A279 both in the Ferrers shape but with Montreal green grounds and not celadon as listed. A284 is in the plain shape. A286 is here represented by a sugar bowl in the Ferrers shape. This version of A288 appears to be in the Plain shape although it is listed as Ely. A292 and A293 are shown here in the Chelsea shape. I have seen a coffee set (together with A294 - see below) including coffee pot, sugar basin and cream jug in a combination of these patterns. I include the small tray listed under A294 because it has the same litho that appears on the coffee cans and stands which form part of the set referred to above. A295 is in the Ely shape with a fish centre (Roach) by Donald Birbeck. Listed with a Montreal green ground, this example is in cobalt blue. A299 - The two Dean plates are in the Stanhope shape. Listed with an ivory ground, there is also a Montreal green ground version above. A selection of pieces in pattern A300. The plates are in the Stanhope shape. The coffee cups and saucers are in the Gadroon shape. The Gresley and Jessop plate centres were probably painted by the named artists. The final image is believed to be in the Stanhope shape and a "tall" version of a teacup but I do not have an outline shape sketch to confirm this. I have included the dates where pieces are marked so that they can be related to the biographies of the artists. A302 is in the Royal Gadroon shape with Montreal green ground and centre by Gresley. A303 is in the Ely shape with centre by Gresley. Here shown with a Montreal green ground, it is listed with a maroon border. A308 is in the Ely shape. A314 is a red version of A259. A315 is a version of A300 in the Stanhope shape with litho flower centre. Gadroon version of A315 followed by a Stanhope shape plate with a celadon ground. A317 is in the Clarence shape with ivory ground and painted rose centre by Gresley. A327 is a version of A300 in the Gadroon shape but with no flower centre. A328 is in the Stanhope shape and similar to A300 but with a litho bird centre. Alongside is a gadroon shape coffee saucer. The Coronation provides a useful fixed date in the pattern books. The Coronation mug (shape 1689) was made in three sizes - Large 4.5", Medium 3.75" and Small 3". 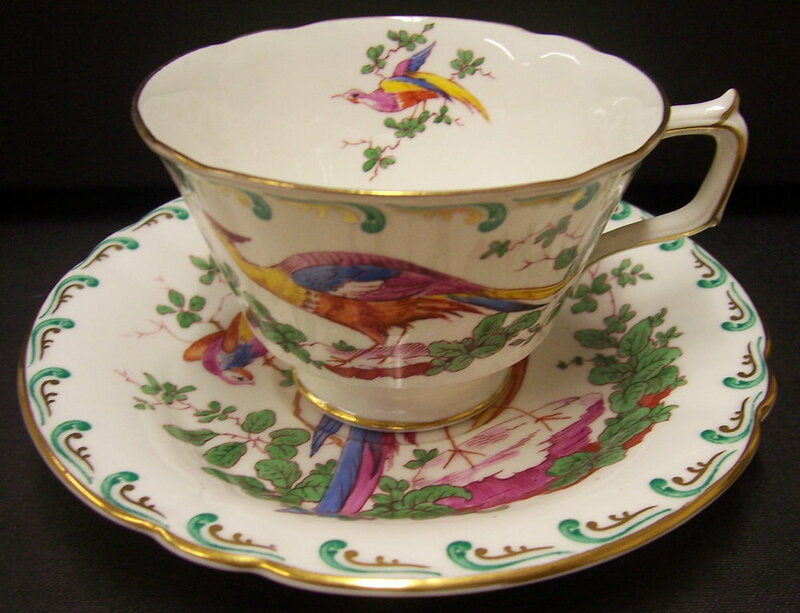 In addition a loving cup in the Campana shape (1844) 4.5" was made. It is not shown here, but the shape is identical to that listed under A332 below. A331 is in the Clarence shape with a Dean centre. The information regarding the Coronation ware is identical to that already given above. The Milford cup and saucer are in the (Royal) Gadroon shape. The Milford variant plate with the posie centre is marked A340 but has a much later (undated) back stamp. A348 is a version of the Asian Rose pattern in the plain shape and without a centre pattern. A350 is a multi- coloured version of the "Peacock and Worm" pattern on the Chelsea shape. 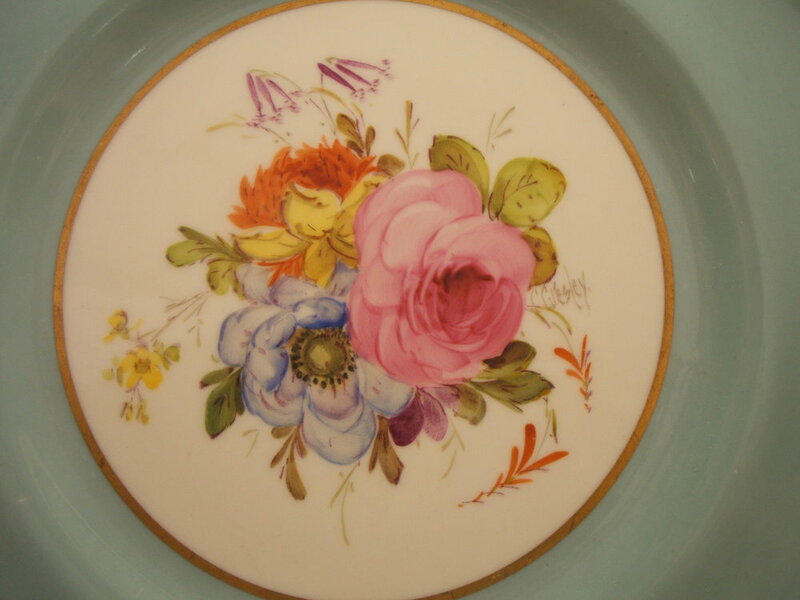 A356 is a posie pattern cream soup in the Ely shape with blue enamel edge border. A396 is the same but with a green enamel edge border. A357 is a version of Red Aves and is listed as being in the Plain shape. The image shows a coffee can and stand in the Edinburgh shape. A395 (Not shown) is the same but in Green Aves. All are in the Ely shape. A358 is listed as having a Golden Fawn ground but here is in maroon. I have also seen a Montreal green version of this pattern. A359 Cup and saucer in the Ely shape with pattern printed in chrome green. A361 is the same pattern but printed in red. A364 is my representation of this pattern. Plain shape plate with Birbeck bird scene (Here Pintail) extending all over the plate. Strong gold edge. A378 is a version of A371 Edensor but with a celadon ground. Listed in the Ely shape this coffee can and stand are in the Edinburgh shape. The variant version has a cobalt ground. A381 is in the Gadroon shape and is like the Milford pattern but has a celadon and not the Montreal green ground listed. A383 is in the Plain shape. A387 is a version of A375 with a cobalt ground. It is in the Ely shape. A389 is in the Clarence shape with a rose du barri ground. A353 is this plate without the pink ground. A392 is in the Ely shape. A401 is a multicoloured version of the "Victoria" pattern on the Plain shape. Both A413 Cotswold pieces are in the Chelsea shape. A416 is in the Edinburgh shape. A Clarence shape plate with hand painted bird centre signed by Darlington and dated, I believe, 1921, although the mark is not clear. Darlington is reported to have died in 1927 (See Twitchett and Bailey) but I have included it because the the printed bird centre, which appears in pattern A420 (see below), is so similar. Examples of the A420 pattern including Edinburgh, Surrey and Gadroon shapes. A422 is in the Ely shape. A424 is in the Clarence shape with a Dean centre ("Lathkil Dale"). Dean centres "Tissington Spires" and "Ashford in the Water" have also been seen in this pattern. A426 is a coloured version of Aves in the Ely pattern. 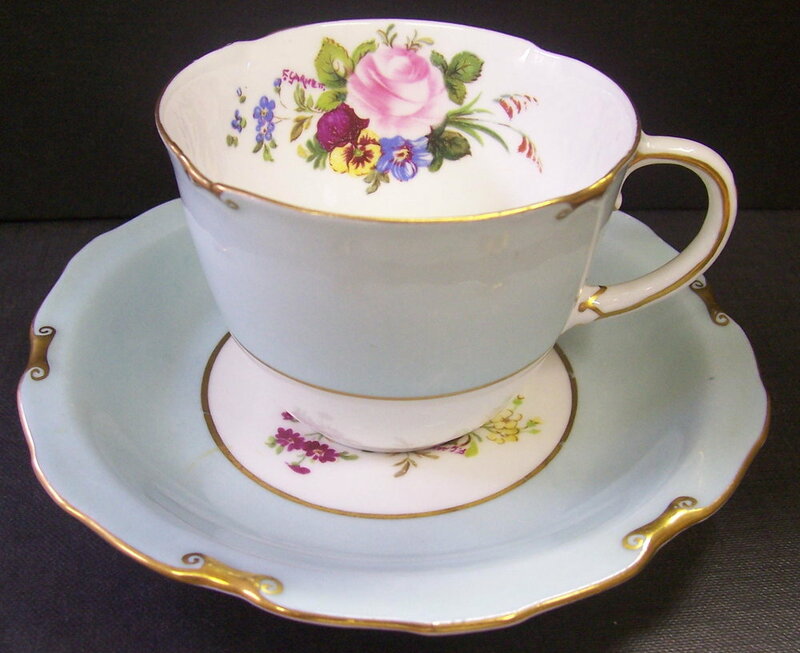 A431 - Version of pattern number A78 in the Dover shape with celadon ground to saucer and outside cup. A436 is in the Ely shape and is listed as having two celadon bands. This is a cobalt version. All are listed as being in the Ely shape. The image of A453 here shows a coffee can in the Edinburgh shape. Pattern A453 is a re-issue of pattern 3504. A454 is entitled "Flowered border and centre"
A458 is a version of posie with blue enamel ornaments in the Beaufort shape. A459 is a version of A437 and A445 in the Ely shape. A467 is similar to A458 in the Beaufort shape with blue ornaments but has bird lithos. A482 - Similar to A128 but in the Ely shape and with centre. A480 (Not Shown), is this pattern minus the centre. A485 Ellesmere shape plate with golden fawn ground and centre by Gresley. The coffee cup and saucer are in the same pattern but in the Edinburgh shape and with a Garnett centre. A492 is in the Brighton shape and has an ivory ground with Dean centre. In this case the image is of "Lion Rock". I have also seen "Stratford Upon Avon" and "Monsal Dale" versions. It is listed as having a Montreal green ground. A495 Rutland and A496 Purple Scroll are both in the Ely shape. The A495 Variant plate has a "Conway Castle" centre. A497 - As A495 but border printed in No 3 golden brown and painted in Emery’s enamel orange. Five pieces in the A498 pattern all in the Ely shape. The green and gold beads were painted by hand. A566 is this pattern with purple beads.